A question that we hear often from clients is, "I'm not ranking on Page 1 for "(major city) bed and breakfast"." My first response is always, "Well, are you located in (major city)?" And in these cases, the answer is usually something like, "Not exactly, but we are really close..."
What does Google consider to be the boundaries of (major city)? Google Maps search for "Boston, MA"
sample search for "boston bed and breakfast"
After you scroll past all of the paid ads, you will come across the Map Pack (Local Pack) (3-Pack). Notice how much of the city of Boston is not included in this search! Aren't there also B&Bs in Roxbury? Yes. Aren't there also B&Bs in Hyde Park? Yes. Aren't there also B&Bs in Ashmont? Yes. Aren't there also B&Bs in Worcester, just about an hour outside of Boston? Yes. But does Google choose to include any of these areas initially for the search, "boston bed and breakfast"? No. 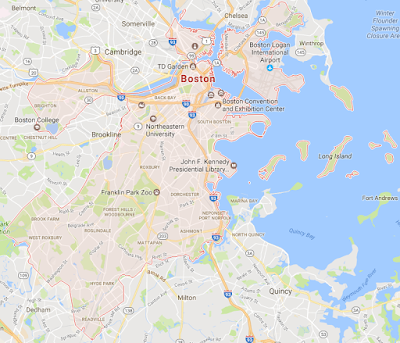 What we can glean from these sample searches is that based on their seemingly endless data bank, Google has made a determination regarding what geographic area searchers are interested in when they search for "boston bed and breakfast". We need to realize that your physical location is the biggest factor when it comes to Local Search. Regardless of how good your Reviews are, if you're not in that specific geographic location, Google can't actually include you in those search results. 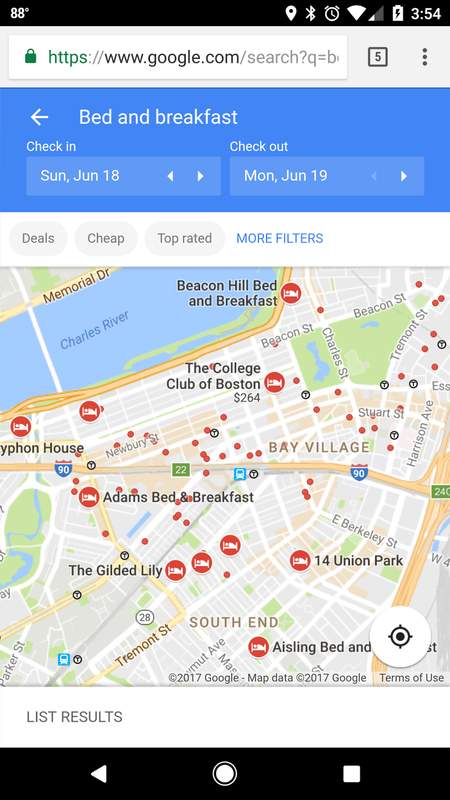 Google knows that if someone searches for "boston bed and breakfast", they are most likely looking for something in the heart of the city, so Google shows the results that most accurately match that intent. So you have to think: does my business more accurately identify with "boston bed and breakfast" or "bed and breakfast outside boston"? A related concern is, "I'm not ranking on Page 1 for "(major city) hotel"." My first response is always, "Well, are you a hotel in (major city)?" And in these cases, the answer is usually something like, "Not exactly, we are a bed and breakfast..."
Just as Google can't be tricked into believing that you're located in Boston if you're not, Google can't be tricked into believing that you're a hotel if you're actually a 2-room B&B. In fact, you don't want to trick Google, anyway. 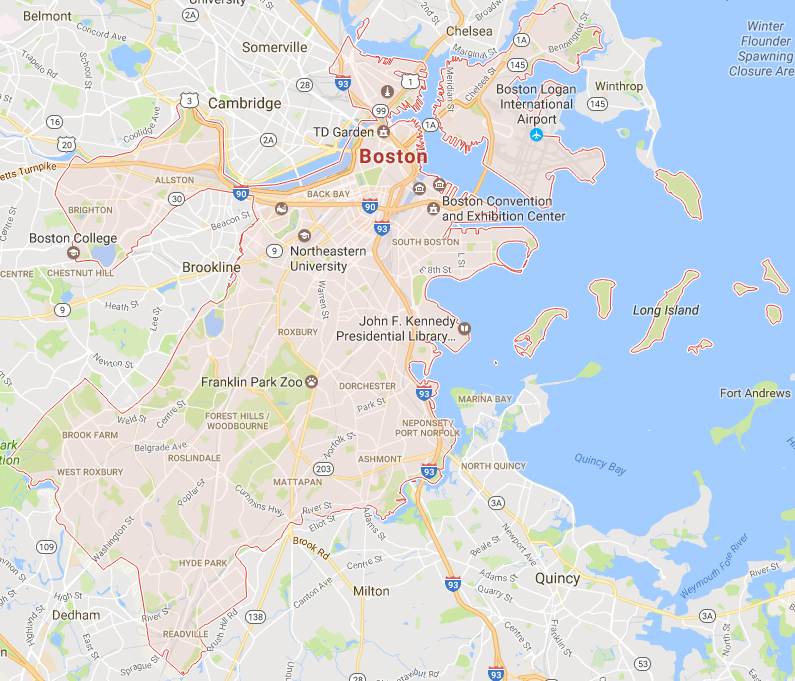 If someone does a search for "boston bed and breakfast", they see your website listed in the search results, they click on your link and go to your website, they immediately see that you're in Worcester and not in Boston, they hit the Back button. Now your Bounce Rate is higher. If someone does a search for "boston hotel", they see your website listed in the search results, they click on your link and go to your website, they immediately see that you're not a hotel, they hit the Back button. Google uses your Bounce Rate as one of many indicators to know whether or not your website is relevant to the search query. It's only a matter of time before any attempts to trick Google will backfire on you. Embrace where you are! Not the large metro area that's an hour away from you. 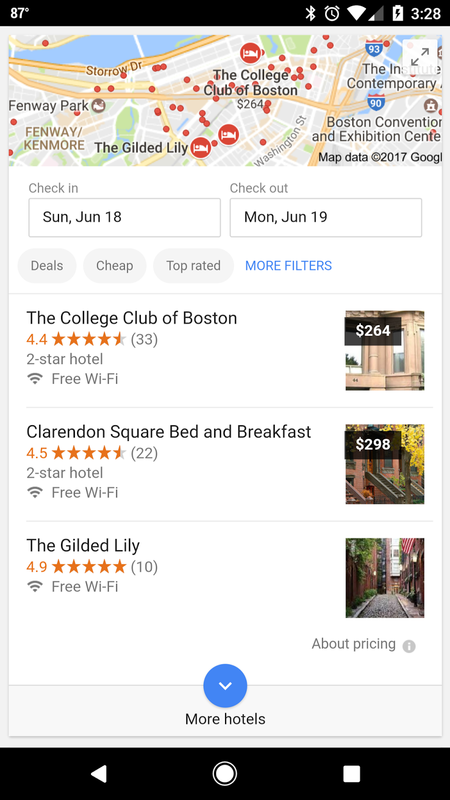 Remember the sample search above - not even all B&B's that are in Boston get immediately included in the search results for "boston bed and breakfast". So if you're outside of city limits, it's even more unrealistic to expect those rankings. Every location has some redeeming quality - that's why you decided to do business there, right? So embrace your area's attractions and target travelers who feel the same way. You can optimize content for "near (major city)" or "staycations close to (major city)". Blogging about attractions around you can help increase your exposure in searches where, by definition, Local Search can't rank you. Instead of aiming for higher traffic volumes, aim for higher traffic quality. Use your website and social media to target travelers who actually want to stay where you are. Don't confuse and frustrate travelers by trying to trick Google.